Christian Refner: People often fear him, but I don't. Jacob Pederson: That he started flat broke? In a very poor area of India, the altruist Danish Jacob Pederson (Mads Mikkelsen) teaches and nurses children in an orphanage and has raised the eight year old Pramod since he was a foster baby. When Jacob is invited to travel to Copenhagen to meet the wealthy businessman Jørgen Lennart Hannson (Rolf Lassgård) that intends to donate a large amount to the orphanage, the reluctant Jacob is convinced by the director Mrs. Shaw (Meenal Patel) that he must travel for the good of the children, and he promises to Pramod to be back on his birthday on the next week. Jacob has a meeting with the self-made tycoon that promises a donation of one million-dollar and is invited to go to the wedding of his daughter Anna Hannson (Stine Fischer Christensen) on the next day. 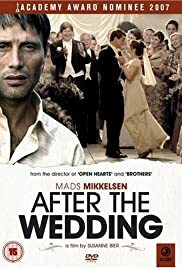 In the wedding, Jacob sees Jørgen's wife Helene Hannson (Sidse Babett Knudsen), who had a past with him, and discovers a family secret that will affect his and the Hannson's lives. "Efter Brylluppet" is an intense and engaging family drama. The beginning (and the end) of this movie discloses the poor conditions of people in India and gives the false idea that the plot would be about the social differences between India and Denmark. Then there is a twist in the unpredictable story focusing serendipity and the personal dramas with many other discoveries of the lead characters and the masterminded plan of the clever Jørgen. All the characters are believable and human supported by magnificent direction of Susanne Blier that plays the emotions and feelings of the viewers; an awesome screenplay and top-notch performances. Sidse Babett Knudsen and Stine Fischer Christensen are very beautiful women and I really loved this feature. My vote is nine.